WATCH! Taylor Swift 'shakes it off' with her biggest fan! WATCH! Taylor Swift ‘shakes it off’ with her biggest 7-year-old fan! Taylor Swift is renowned for her kindness and generosity towards her fans, and this video makes it even more true! Taylor Swift has always been there for her fans – whether she’s visiting them in hospital with her guitar and singing to them, proudly wearing a jumper a fan knitted for her, or stalking her own fans on tumblr – her antics with her fans hit the headlines more than her hectic love-life! 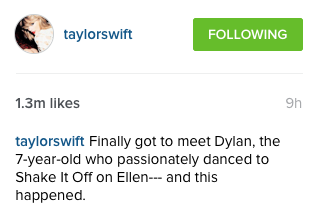 Dylan Barnes appeared on The Ellen Show after a video of him busting some sassy moves to Swift’s songs in his living room went viral. The host, Ellen Degeneres, interviewed him and even let him perform on the show. He explained that after the popularity of the video, his classmates and teachers held a parade for him at school with banners saying ‘Dylan is a superstar!’ so he’s pretty much already a celebrity. As if appearing on one of the most watched talk shows in America isn’t enough, Dylan received tickets to go and see his idol on tour and meet the pop princess backstage after the concert. The clip which you can watch here shows the two of them rocking out to the song – and even though their dancing resembles our cheesy, drunken Saturday nights, Taylor still looks flawless; and we’re still really jealous. Mojdeh Barnes, Dylan’s mum, was quick to thank the the singer for making his dreams a reality. ‘Thank you @taylorswift13 for making #persianbigred dreams come true! You are a class act!’ she tweeted. We couldn’t agree more. Who knows, maybe he’ll be one of Taylor’s back up dancers one day!